Free Money Finance - I found this blog through my agent and I now read it whenever I have the chance. I'm catching up on past posts too. Read today's post and this post, they both relate to living simply. Soule Mama has a Paper Princess giveaway today. There are also some gorgeous photos of baby Harper. Suse at Pea Soup writes about everything from the Blogger verification words to circus skills, and much more. 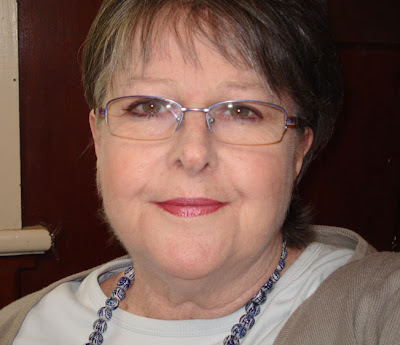 She shares her knitting and sewing projects and her view of life from Melbourne Australia. Check out the beautiful Christmas card over at Knot Garden. I have been enjoying six and a half stitches for a little while now. It's well written, creative and warm. Over at Nini Makes there is some Christmas embroidery and many other delights, including some great tutorials. At The Long Thread I found these delightful felted Christmas trees. This is such a good idea and I'm hoping to make a couple before Christmas. 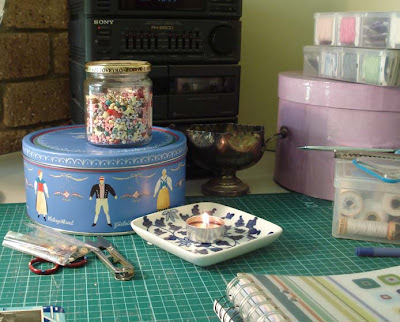 Have a look around this blog because, if you're a crafty person, there are many treasures to be found. I've just found this Links for Good Reading and Resources list on Small Notebook - well, I'm on it too, but there are many others worthy of your time. And finally, I promise, Emily commented here this morning. I've checked out her blogs and it's wonderful. She writes Remodeling This Life. 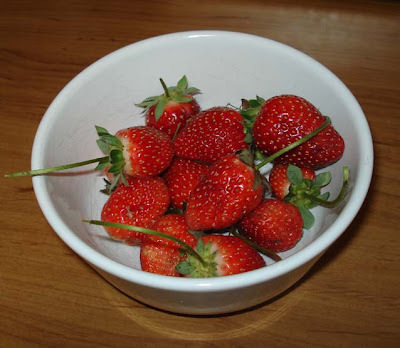 Strawberries picked in the backyard two days ago. I have no idea what I'm going to write about today. Generally, I have a vague notion because I've taken some photos, but today, nothing. I do hope all my American friends are enjoying Thanksgiving. As I write this it's 4.30 am here, 10.30am in San Francisco and 1.30pm in New York so I have visions of turkey and stuffing either being eaten or still in the oven. Whatever you're doing, whom ever you are with, I hope you have a lovely day. It's been a very quiet week here. 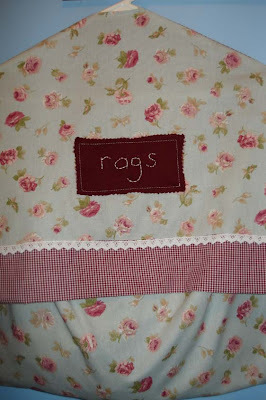 I rise at 4, write my blog, feed the animals, have breakfast, tidy up and then lock myself in the sewing room with the laptop to write most of the day. I look out to the garden, and often see Hanno working out there, but I remain seated, clicking away on the keys, sorting through notes and, sometimes, fighting the inclination to go outside. I have found over the years that writing is a brain function you have to work up to. When I first started, it was very difficult to concentrate, I would think about what I'd just finished or what I was going to do later. Now that I have built a routine around it, it's easier to sit and stay focused, but I still have to fight the urge to leave when I see Hanno outside working in the cool shade, checking pumpkins, pouring water on plants or talking to Alice. We live a charmed life. Gone are the days of regular routines, having to do laundry every day, working for others, and being ruled by a clock. Our days here are often a duplicate of the day before but each day seems fresh and new. The familiarity of it all allows us to glide through our days with ease, tweaking this, mending that, planting, harvesting, planning and living well. Each day we piece together another part of our life's patchwork - a gentle jumble of doing what we have to do and doing what we want to do. I didn't know this kind of contentment was freely available to those who persevered with the ups and downs of ordinary life. When I was younger and my family, my job and my housework drained all strength from me, I didn't know there was a reward waiting. But here I am, living the reward, and I am here to remind you of it too. There are seasons in our lives that we all must go through to reach the next stage. Some seasons, especially those in young married life when a mortgage is being paid and children are being raised, are so intense they sometimes blur the rewards of the work. But when you come out the other end and your children set out on their own lives, you set out on yours again too. Oh, it's sad to see them go, but you soon realise it's just another stage and new activities and tasks will soon consume you, while you build your life around the newness of it all. So on this day of thanksgiving, no matter at what stage of life you're at, I hope you understand that if you're going through hard times or good times, they are the extremes of life. Most of it is just plain old life, nothing fancy, it's just breathing in and breathing out, and if you're smart, you'll see the worth of ordinary life and make every day count. Continuing on with the theme of getting harmful chemicals out of your home, I want to focus on airborne compounds today. They seem so innocent, don't they. Advertisements that tell us about the "natural" mist of lemon fragrance or to wake up to the smell of meadow. And because it seems so innocent, we fail to question their safety and we spray them, light them or plug them in believing that we are contributing to the wellbeing of our families. I was absolutely gob smacked recently when I saw an advert for a well known Australian brand of insecticide telling us about their new "natural automatic insect control system". You mount the product on the wall and every 13 minutes it automatically releases a spray of insecticide, or as they call it - a spray of insect control. Every 13 minutes a blast of poison capable of killing an insect! Am I the only one who thinks that is insane? I have no doubt that stuff is selling like hot cakes. And I also have no doubt that if people thought about it, they'd realise the potential danger. Air fresheners are another area of concern for me. Many synthetic fragrances are produced using petroleum and other harmful compounds you do not want in your home. Those air fresheners that are plugged in or that automatically blast the fragrance at preset times, are, in my opinion, best left on the supermarket shelves. If you want to add fragrance to your home, use essential oil in a burner. They are supposed to be harmless, but again, I never use them. Fresh air is the only 'fragrance' I want to smell. I open the doors and windows every chance I get and let the air in from the rainforest. No doubt airborne pollution gets in when I do that but I'd rather that than being in a closed up house with synthetic fragrance or insecticide. I have no idea how insects are dealt with in other countries but here airborne insect sprays are commonly used, so are surface sprays. But have no doubt, my friends, even though they are called "spray" or "insect control system" what you are spraying is poison. They may be low grade poison or "pyrethrum-based" but consistent use of anything like that may have the potential for harm. 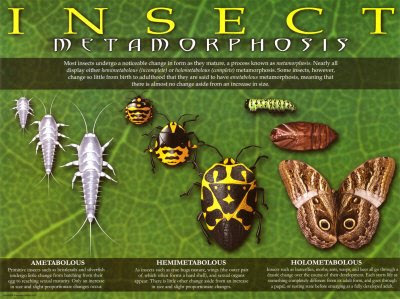 And you should remember that most insects are harmless and life on earth as we know it would be impossible without them. 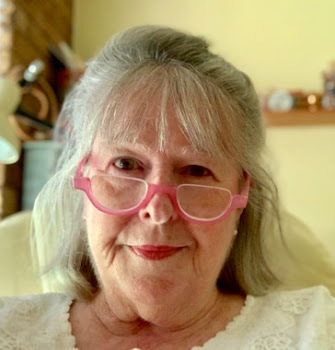 Now you all know I'm an old granny from way back, so you won't be surprised to know I use a fly swatter for flies and mosquitoes, and for the occasional spider. (While I am writing this a huntsman spider is crawling on the wall in front of me. They are harmless and they eat other spiders and insects.) It is common practice in Australia to have homes routinely sprayed for spiders and other insects. We don't have this done. I would rather live with spiders than poison. We've lived here for 11 years (as of today!) and we don't have a problem with spiders, ants or any other insect. We have insect screens and doors and if something gets in, we either live with it, as in the case of some spiders, or kill it with the swatter. I use the exclusion method for pantry moths, weevils and those insects we get in grains and cereals. I freeze flour, grains and cereals when I bring them home from the shop to kill any larvae they may develop and infest the pantry or stockpile. After freezing, the food is put into airtight containers. I wipe the pantry shelves frequently. 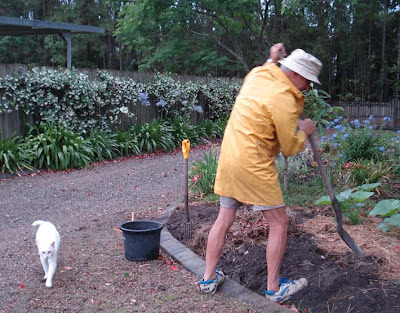 If the dog, cat or chooks have fleas or lice, we use diatomaceous earth which is available from garden or produce stores. It works every time. Be aware that every time you smell something in the air, and even when you don't, there may be chemical compounds around you - especially in a new home or car. That new car smell - that's chemicals. New carpets, plastics, some benchtops, some paints all give off airborne chemicals. Here is a recipe for milk paint, a better alternative to many commercial paints. I know there will be times that you might have to use some form of poison in your home but I hope that you know the risks associated with whatever you use. Even seemingly harmless things like deodorants, hairspray, makeup and new clothing may contain compounds that may cause harm. Be aware, read labels, do research and know what you're bringing into your home. Your family's health depends on it. 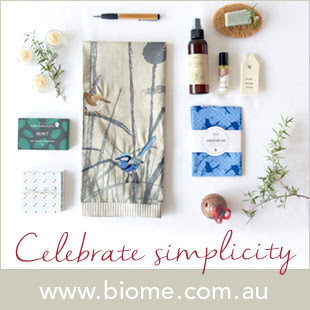 When I started simplifying, natural cleaning was one of the first things I went to. I used up all the chemical cleaners I had in the house and used bicarb, white vinegar, salt, washing soda, water and elbow grease instead. I'd forgotten how easy if was to clean without harsh chemicals but the thing that amazed me was that I'd been hoodwinked into thinking I needed a different cleaner for a whole lot of different things. Wrong! I was born in the 1940s, well before the onslaught of all those products commonly used now. Having lived in both camps, let me tell you that natural cleaning is better for you, your family, your wallet and your environment. I've written about green cleaning before and have a post with recipes here. Today I want to write about the most basic of cleaning methods - soaking and cleaning with water and rags. 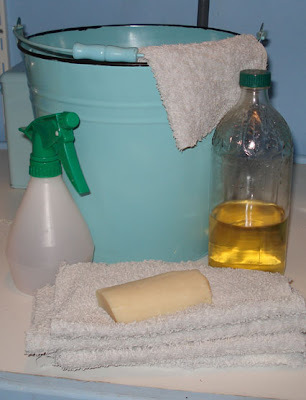 A good cleaning kit - a bucket of water, rags, soap and white vinegar (which looks yellow in this photo for some reason), you supply the elbow grease. The laundry detergent listed in those green recipes will serve you well for most of your clothes but as we all know there are those times when we need a bit more of a punch to get rid of stains. You can either use the heavy duty laundry detergent or you can soak your clothes. Soaking was something that was routinely done when I was a girl. You would either fill the laundry tub if you had a lot of things to soak, or a bucket for a small amount. Then wet the stained article, rub in a good amount of laundry soap, making sure you rub over the entire stain properly, then just put it in the water to soak. Generally these clothes would be soaked overnight and then washed in the machine the following morning. Oxygen bleach - the powder bleach - is one of the few chemical cleaners I still buy, but I use it sparingly. If I want to whiten up yellowing cotton or linen, or remove a stubborn stain, I soak it overnight in hot water to which two tablespoons of oxygen bleach has been added. 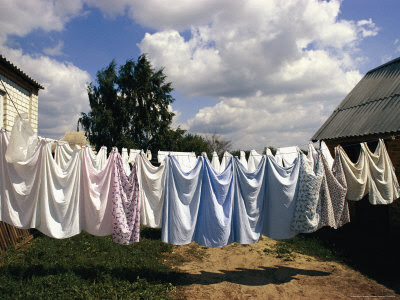 Again, the following morning, the clothing is washed, as normal, in the washing machine. But clothing isn't the only thing that will benefit from this treatment. I remove grease on my stove top with plain water and a little soap on a rag. Before I am ready to clean the stove, I pour about half a cup of warm or cold water over the dirty areas and let it sit there soaking until I'm ready to clean. Then I get a clean terry cloth rag, dip it in water and soap it up. I wipe the stove top with that soapy rag, over spills and grease that have been softened by the soaking water, and everything is easily removed - without harsh chemicals. If there is something still stuck on, I rub it with a luffa, a luffa and soap is a powerful ally. Usually I rinse out the rag a few times and repeat the cleaning and when it's clean, I wipe over with a clean and dry rag. I never leave wet surfaces, I always dry them with clean rags. Leaving a wet surface to dry usually gives you streak marks, so it's best to dry it off. You'll find this will finish off your cleaning properly, giving a bit of a polish. Bicarb in the detergent holder and white vinegar in the rinse aide holder. I'm not sure what causes it to happen, but every so often we get an influx of new readers. Now is one of those times so I welcome all the new comers, I hope you find information here you can use in your life. We had a really busy day at the Centre yesterday. I was tired just driving home so when I got here I took a walk through the garden to sharpen myself up. Hanno was still outside pouring buckets of water on plants and generally fine tuning things. We had some wild weather in the past week and it's taken a toll on the garden. 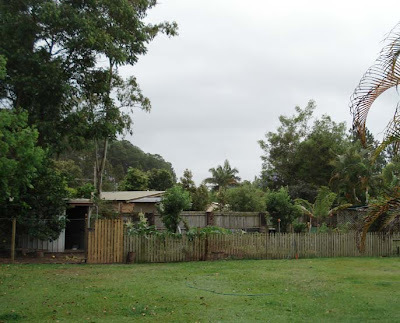 Nothing's ruined but there are torn leaves and general wind damage, my large potted elephant ears on the front verandah has fallen off its stake which snapped in the wind. 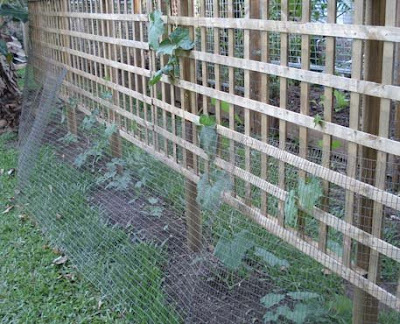 One of the big changes that has happened since I took you through the garden is that Hanno stripped the tomato bushes growing on the lattice, and then removed the bushes. They were past their prime so they've been replaced with new compost in the soil and new sultana white grape vines. We put the lattice up to help protect our bedroom wall and windows from the harsh western summer sun, the tomatoes were only in for a quick crop before we planted the shade vines. 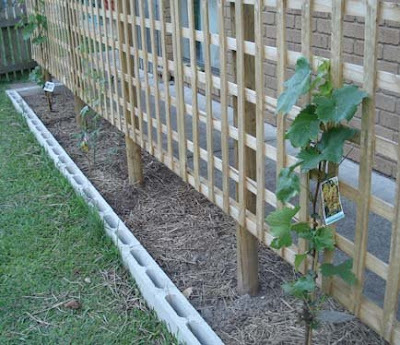 We only plant food or useful plants now so a grape vine that will give us shade and grapes in the summer, and drop its leaves in winter to let in the warm sun is just what we wanted. In the middle of the two grape vines is a yellow banana passionfruit vine that will twirl its way through the grapes. It will be cut back when the grapes lose their leaves. Replacement tomatoes were planted out a few weeks ago in the vegetable garden, so in this home, where fresh tomatoes are eaten every day, we will not be short of a tomato all through the summer. These are Grosse Lisse, not my favourite tomato, but mighty tasty just the same. 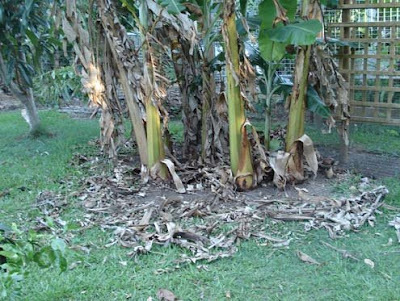 One of the victims of the windy weather was the corn. It's ready to pick now but you can see here that the leaves have been damaged. I'll pick some of this later in the week to have for dinner. 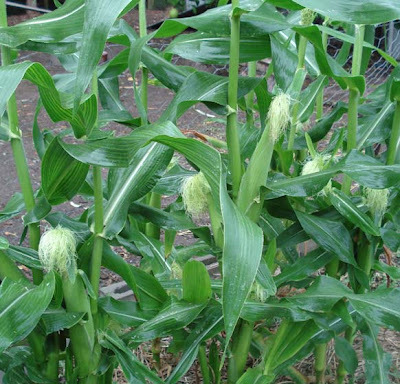 Corn is one of those vegetables, peas are the same, that should be eaten as soon as it's picked. 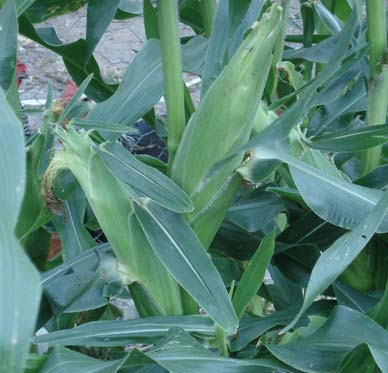 The sugars in corn start turning into starch as soon as its picked, so if you want sweet corn, make sure you pick it at the last minute, and have your water boiling when you walk back inside with your corn. If you can't do this, or if you have a lot of corn, blanching and freezing it is the best option. Store it in plastic bags or containers suitable for your family size. Can you see eyes and beaks behind the corn? Out in the front garden, where we planted rosellas last summer, golden nugget pumpkin are growing. These are just the right size for Hanno and I, although that's not the reason we are growing this type of pumpkin. Hanno can't stand pumpkin vines rambling all over the garden, I love that mad aspect of pumpkins. I love that they're untamed and wild and go wherever they want to go. But as I don't mow the lawn and have to cope with mad pumpkins, Hanno didn't want to grow pumpkins again. We compromised with the golden nuggets as they are a bush variety and are well contained within their garden. No mad pumpkins = happy Hanno. Fresh pumpkins from the garden = happy Rhonda. Win/Win. On the far eastern side of the garden, in full sun, we're now growing luffas. We'll use these in the house for showering and cleaning later in the year and if, as I expect, we have an abundance, I'll sell some with my soap. I've written about a previous crop of luffas and how to clean them here. Right next to the luffas we are growing bananas. We let the chooks out to free range every day and this, my friends, is what they do to the bananas almost every day. 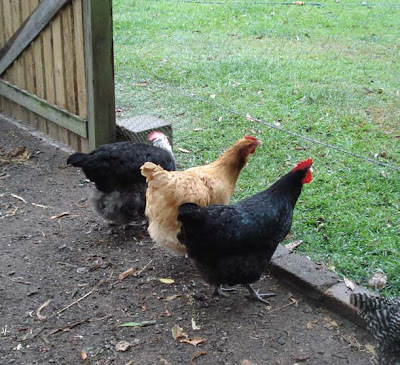 We use the old banana leaves as a mulch and the chooks love to get in there and scratch it out. Hanno, ever patient, rakes it all back in when they go back to their coop. 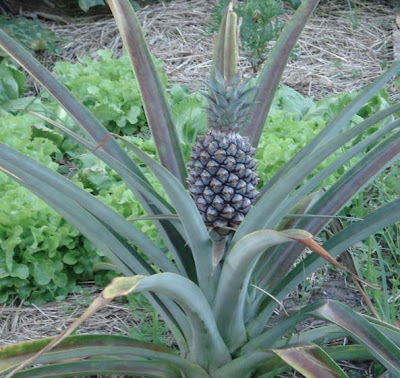 And for those of you wondering about the lone pineapple, here it is as of yesterday. It's still growing slowly, I doubt now that it will be a Christmas day treat for us. But whenever it's ready to eat, we'll be grateful for it and pleased we planted it. In the rest of the garden, we have removed the zucchinis and button squash and replaced them with lettuce, bok choi and beans. Beets have been harvested, along with many kilos of tomatoes, capsicum (peppers), leeks, chard, lettuce, radishes, cucumbers and herbs. 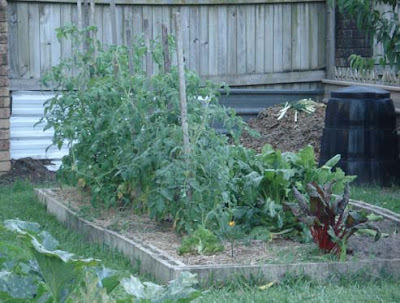 Ours is a year long garden so there is always work to be done and harvests to gather but eating organic vegetables fresh from the backyard every day makes it all worthwhile. It always seems fresh and new to me here. Like every morning when I get up to a brand new day there are possibilities and treasures just waiting to be uncovered. Hanno and I spent the weekend behind a closed gate again - no one here but he and me. I haven't said anything here but I've been missing Rosie a lot. I think Alice misses her too, or is that just me transferring my feelings to her? I don't know. When we have tea on the verandah I always think of Rosie sitting there staring at me and waiting for something to eat, then I remember and look over to where she is buried. Pets are a lot like family members, they take up a big place in your heart. So we have starting talking about getting another dog! It's early days yet, and it will be after summer before we think about taking the next step, but the talks are going on. It feels good and I'm sure Rosie would love to know that Alice has a puppy to play with. I wonder if it is true that you can tell a lot about a person from what they keep on their desk. The photo above, and the first two photos, are things on my desk. 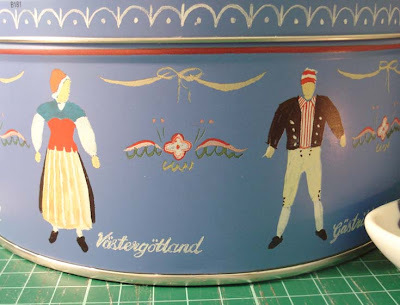 While I was looking at them, and hoping for some writing inspiration, I wondered why none of the figures - both the wooden one and the painted ones on the tin, have no facial features - no eyes, nose or mouth. All of them are Swedish, so can my Swedish friends enlighten me. The rest of my weekend was spent cutting soap, cleaning the bathroom, reading and talking. Shane's girlfriend Sarndra phoned to say hello and tell me that Shane hasn't called because he's very busy. His head chef is away and Shane is filling in for him, plus doing his own job. Sarndra is such a lovely girl. We had a nice chat for about 20 minutes. They will be up here in the next couple of weeks. There is another busy week coming up. I'm back at work today and tomorrow and that is always a busy time for me. It's a sharp comparison to being here but one I look forward to each week. I hope your week is a good one. Don't forget to look after yourself. 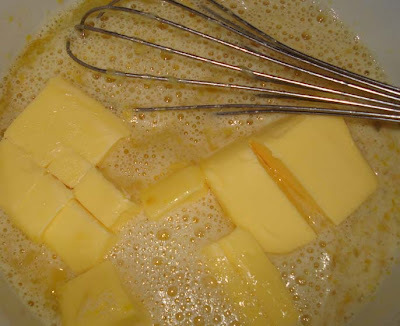 Place butter and sugar in a bowl and mix with electric beaters until light and fluffy. Add eggs one at a time and beat in. Sift in the flour and cocoa and stir until well mixed. Place into greased and lined pan and place in the oven for about 40 minutes. 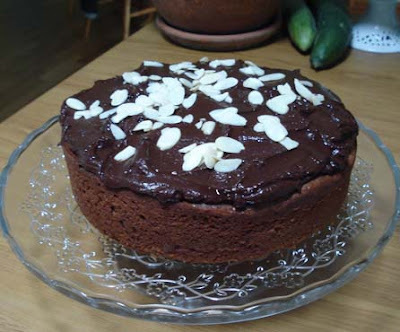 When the cake is cool, cover it with frosting - melted chocolate, butter and icing (confectioner's) sugar. ADDITION: I've added some links on the sidebar to sites that may help you with your finances. I want to point you in the direction of freemoneyfinance. 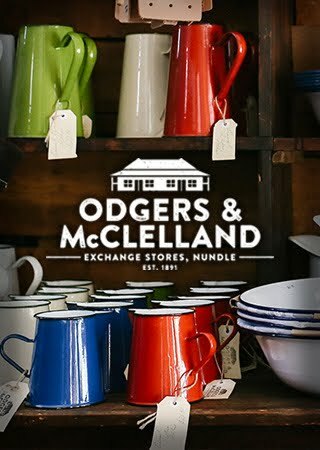 My agent told me about this blog a little while ago and now that I've had the time to check it out, I recommend it to you. It's very good. Those readers who have been visiting me here for a while will know that my aunty Joy died in early September. Joy was a big part of my life, she was my god-mother, as well as a much loved aunt and my mum's only sister. Sadly, Joy's son Stephen died yesterday. He'd been ill for a long time. RIP Stephen. It was after I drove back from Joy's funeral that my knee got sore, and after that, two months of pain and feeling terrible followed. I'm really pleased to say that this week I'm back to my normal self and thankful to be able to do everything I was doing in the past. Pain is a horrible bedfellow, it steals your strength and passion from you. I am glad I left it behind me, but in a strange way I appreciate what I went through because it has made me genuinely appreciate the ability I have to do what I want and live as I do. I truly feel for all those who live with chronic pain and illness. So this week has been a bit of a whirlwind for me. I have my strength and drive back! 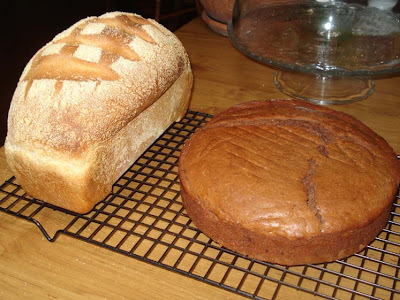 I've been baking, cooking, knitting, making soap and writing up a storm. If you were reading here last summer you'd know I'm a bit of a cricket freak. Well, my friends, the cricket season started yesterday and with this in mind I decided to work till 2pm and then sit with my knitting in front of the TV. After I finished my blog yesterday, I fed the animals and checked outside for storm damage. There was a lot of water but no damage and I stayed outside a while to watch the creek rush by. It was almost at flooding point on the other side but luckily for the horses that use that paddock, the water rushed out to the sea instead. Tricia phoned to tell me about Stephen and we talked a for short while. Breakfast was tea and toast with organic honey that's starting to harden. When Hanno finished his breakfast, I cleaned the kitchen, made some bread, got that on the rise and then made a chocolate sour cream cake. Morning tea was taken on the verandah where Alice was quite distressed by the March flies hanging around so we came back inside and I started working on my book. I had a few phone calls about a meeting I'm organising about homeless kids at work next week, then back to the book for another hour and a break for lunch. After a quick sandwich, I checked the soap I made yesterday which is taking longer than usual to harden - I used a different recipe of rice bran, olive and coconut oils. Then back to the book for another hour, but before I went to my reward of cricket and knitting, I phoned my uncle (Stephen's father) and my cousin, Susie, Stephen's sister. And for those of you who wanted the pattern for the red mittens, here it is. It's really just a rectangular piece of knitting that is sewn along the side, leaving a space for the thumb. You start at the wrist and work up to the fingers. Leave a long tail of yarn when you cast on because that is what you'll use to sew up the side. In the photo below is the mitten I finished knitting yesterday. Note the yarn tails, one at the top and one at the bottom - these are for sewing the mitten together. Remember to measure this on your hand, or the hand of the person who'll wear it, so you have a good fit. If you have to enlarge or reduce the size, do it in increments of 4 stitches. I started off with 40 stitches - to enlarge it I would have cast on 44 or 48 stitches, to reduce the size I would have cast on 36 or 32 stitches. 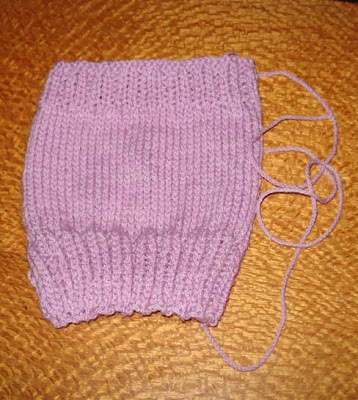 Knit in rib stitch for about 5 cm (2 inches). 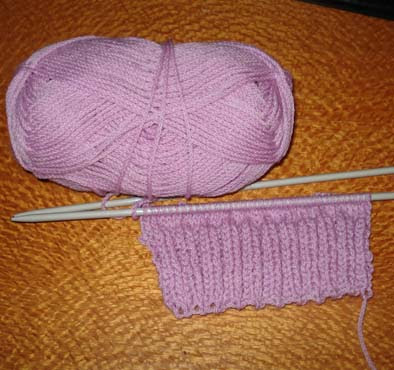 Rib stitch is: knit two, purl two and repeat till the end of the row. 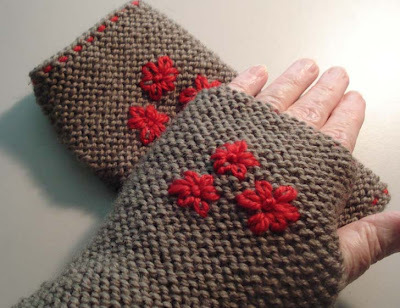 When you have a suitable length to cover the wrist - you can do it longer if you wish - start stocking stitch. Here is a guide. Knit stocking stitch for about 10.5cm (4 inches). Measure on your hand to make sure it is long enough, if it isn't, keep knitting. Finish off with 2.5cm (1 inch) of rib stitch and cast off. Make sure you have your top yarn tail on the same side as the bottom tail. You'll then have a rectangle or a square. Using a large eye sewing needle, thread your yarn tail into the sewing needle and starting at the wrist, sew the sides together. measure it on your hand again so you know where the thumb hole will be and end with a few reinforcing stitches under the thumb hole. Now, from the top end, thread your sewing needle again with the top yarn tail and sew from the fingers down to the the top of the thumb hole, again ending with a few reinforcing stitches. You'll end up with a mitten with a hole for the thumb. And that's it! Simple, isn't it. Have a great day. I'm becoming a tiny bit obsessed with knitting. Well, okay, maybe more than a tiny bit, I'm thinking about knitting at least a few times an hour. It's such a wonderful way to relax and yet be productive at the same time. I feel knitting goes hand in hand with my simple life and so, here is yet another knitting post. LOL!! I am by no means a competent knitter. Oh, I get by, but I'm working every day to improve my skills and every new project I start now pushes me just that little bit further. For those of you who don't knit, knitting is just twirling yarn around knitting needles. What you knit depends on how you twirl and how much you twirl. About 90% of knitting is just a combination of two stitches - plain and purl, but you also need to know how to cast on and off. Knowing those four stitches will make you anything from a dishcloth to a jumper (sweater). It's not easy, but it's not difficult either. It just takes time to practise your stitches and tension so that what you produce looks neat. 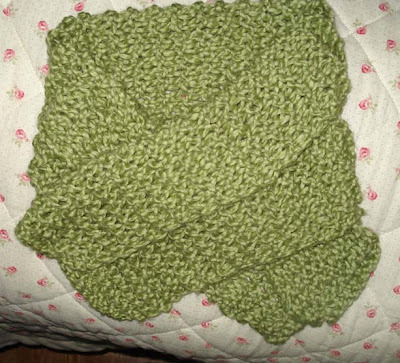 Knitting dishcloths is the perfect way to learn to knit. You can instantly see what each stitch produces and in the end, whether you did a great job or not, you've got a dishcloth you can use for many months in the kitchen. 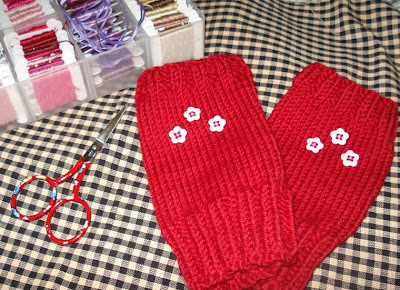 The red fingerless mittens above are the ones I made for my sister, Tricia. They are the same as the mittens I knitted from Heather's pattern at the Co-op, with the addition of ribbed edges. Again the ribbed edges were just another combination of plain and purl. I really like these mittens and have started knitting another pair using a machine washable pure wool 5 ply by Cleckheaton. This is a thinner and lighter wool, perfect for where my sister Kathleen lives, but they will take a little longer to knit. These mittens take less than a ball of wool to knit up and will take an average knitter about two days of on and off knitting to complete. If anyone would like the pattern, let me know and I'll post it later. 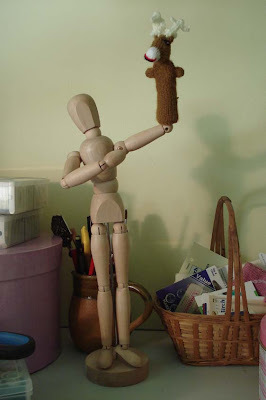 Here are some really lovely links to knitting sites or to articles about knitting. I'm adding The Thrifty Knitter to my side bar too. I hope my northern hemisphere friends have a wonderful winter of knitting by the fire and for those of you not yet bitten by the knitting bug, I hope some of this will inspire you to take up the needles. My Learning to Knit post - it has a link to my favourite waffle weave dishcloth pattern. A wonderful knitting blog - The Thrifty Knitter. 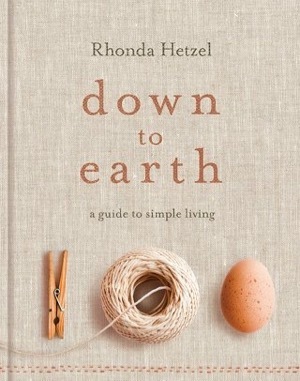 The Daily Green is having an alternative knitting fibres book giveaway for residents of USA and Canada here. New York Times article about knitting and Lions first retail store after 130 years as a wholesaler. In Australia - Bengido Woollen Mills, who sell beautiful yarns online. 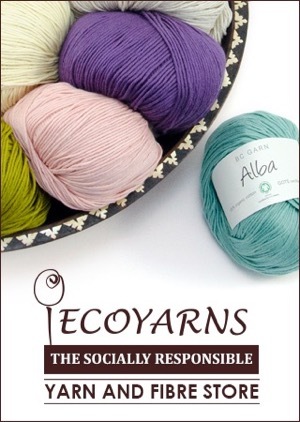 Ravelry - a wonderful knitting community. Knitty - a free online knitting magazine. Posh Yarns free pattern for socks and a lovely shawl. Knitting abbreviations. Don't be put off by these. They'll make sense to you after you've been knitting for a while. Knit for charities in Australia. 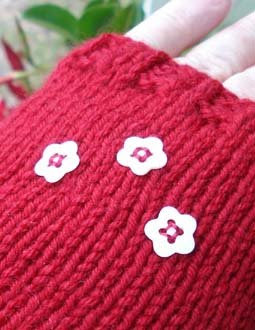 Check out Kim's knit along mittens blog. There are some lovely mits there. I want to add a word about awards. I've been lucky enough to receive many awards while I've been blogging. I appreciate very much the thought and friendship these awards represent but I can no longer accept any new awards. So to Rhonda at Ravelly1 and Bevb who gave me an award recently, I sincerely thank you but please give the award to another blogger. I don't have enough time now to check out other blogs on a regular basis and I don't have enough time to pass the awards on. I have written about this in the past but obviously not everyone reads every post. I might put a note in the side bar but if you have any ideas on how to let people know I don't accept awards, I appreciate hearing them. These are the posts that really make blogging worthwhile for me. Oh sure, I blog for myself in that it creates a good record of what I'm doing here but the real pleasure comes when I connect enough with you to change what you're doing. I am so pleased at the results of this challenge - you have made significant changes by reading your meters, and I'm sure that while you continue to want to save precious resources and money, you'll continue to read your meters and reduce your consumption by doing it. Patricia, our electricity is measured in kilowatt hours (kWh). I'm sure when you start turning off your appliances not in use you'll notice a big difference. Donetta, thank you. It's amazing how much power those plasma screen TVs cost to run. Hanno read your comment too and we talked about it for a while. Gail, welcome. Don't wait to start living the good life. Start today. It's not about location, it's more a change in the way you think and how you live your life. Rhonda, our grandmas were much more frugal than we are. They didn't waste anything. We can learn a lot from the way they ran their homes. Deb, thanks for your comment, it's a good one to repeat here. You did really well and it shows how easy it is to reduce consumption by taking small steps. This is part of what Deb wrote: We are a 2 adult household and reduced our average daily electricity from 18 to 16.5 units and water from 430 to 205 litres. We have just moved back to this house and after the first two days we replaced the existing light globes with energy efficient ones. I turned a few things off at the power point and left the blinds open a little longer so the lights were turned on a little later. I did a couple of loads of washing on each of the first two days but none on either of the second two. We were also more aware of how long we were in the shower and reduced this on the second two days. Emma, you've done well too. I hope you can get your landlord to fix any leaks there. Hi Jacqi, Blogger strikes again. You're doing well too, particularly as you're all at home all day. Hi Bee, welcome. It's great you got that subsidy three months in a row. Well done! Ruralaspirations, you're right, meter reading is a great budgeting tool. Hi Shannon, it doesn't really matter love. You are more aware now of your readings, and what increases and decreases it. Work on your family because without them on board, it will be an exercise in frustration for you. Good luck. Hi Leanne, it takes a while to get to know your own patterns. Keep at it and it will save you money and greenhouse emissions. Cripes Julie! $800 per quarter would send me into a spin. Good luck and make sure the family helps. Hi Donna, the hot showers and laundry really increase usage. I'm really pleased you enjoyed the challenge and hope you continue with it. Well done Kate, that's very impressive. Hi Eli, we use Dipel (it's an organic solution). Read this, it might give you more ideas. Hi Sue, my suggestions are to get everyone in the family to help. They all should turn off lights, TV, iPod and phone chargers at the wall stitch, not just at the appliance itself. Standby power, which is that electricity we waste just to have the convenience of not turning the appliance on at the wall, costs us all a lot of money. Change to CF energy saving light bulbs - this will save a huge amount. When you buy new appliances, make sure they're energy efficient with a high star rating - they cost more but save that money back, plus some, over the course of their lifetime. See what difference there is between hot showers and baths with a few kids in the bath at a time. You'll have to read your meters to find that out. When you're baking, bake more than one thing. Use a slow cooker (crockpot), they're energy efficient. Sweep instead of using the vacuum cleaner. Turn off the computer when not in use. The old style monitors use a lot of power. I'm sure we'll get more tips in the comments today. There were about 3000 readers here yesterday so I hope a lot of the lurkers also read their meters. I'm really pleased so many of you joined in this challenge. I think we've proven just how effective meter reading is. When I went to work yesterday, I thought about the $90 saving we will make over the course of our billing period if we continue to cut back. If someone told me that they would pay me $90 to turn off lights, the TV and chargers, I would certainly do it. The problem is unless we know how much we'll save we rarely go that one step extra to turn off and cut back. Savings are there, we just have to do those small steps to make sure we realise those savings. The important part though is to make it a habit so it's not just a challenge that will be forgotten by next week, but become a normal part of the way we live. ADDED LATER: The Crone has posted her results on her blog. She's got a brand new place it's well worth a visit. Check her out here The Crone at Wits End. Reading our meters gives us a real chance to cut back on our use of precious resources. It's like tracking your money when you start budgeting - you need to know how much you're spending, and on what. 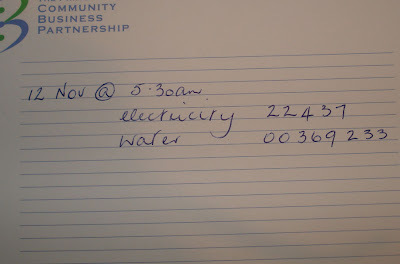 On my first day of meter reading my electricity meter was on 22437, my water meter was 369233. When I did the second reading after using normally for two days, the meter read 22469 which is pretty dismal for us. It just shows me that we have to watch this all the time and not think it's okay to leave appliances plugged in or lights turned on. The second reading was 22488. Much better but it's not our best. We can get it much lower than that and I'll talk to Hanno later in the week about getting back to our old levels. According to our latest bill, which went up yet again!, that reduction over two days would have saved us about $90 over the course of a normal billing period. That's incredible, but it shows just how powerful a saving tool it is to read the meter. The reduction in greenhouse gas emission is incredible too. If we can stay on that lower level we would be saving tonnes of gas emissions every billing period. That was much the same over the four days: we used between 102 and 107 litres each (28.8 gallons) per day. The thing that really get me about this exercise is that is is SO easy to do. Turning off, unplugging, hanging out, cutting back - it's simple and easy and everyone can do it. We just have to have the will to do it. I'm pretty sure the cost of utilities is rising world wide. Our electricity cost has risen twice in the past year. Let's do something about it. Let's stop being sitting ducks for the utility companies to rake in profits by taking control of ourselves and our usage of these precious products. Now is the time, my friends. We can all do it. So how did you go? I hope you saved a lot - both in gasses and money but my wish for all of us is that we will be amazed at how easy it is to cut back and shocked enough by our reductions that we keep them low. Now I'm looking forward to reading all the comments about your reductions. PS: To all those who asked about the storms here, Hanno and I are fine. We had, and are still having, a lot of rain, but there was little wind here and no damage. Just 50km south, entire streets were wiped out, houses flattened and trees down. It's incredible, as on the same news broadcast we saw those terrible fires in LA. I hope everyone here from that area is safe and sound. Thanks for asking about H and I. 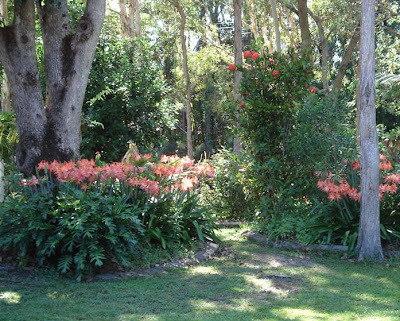 Above is the garden leading to our closed gate. 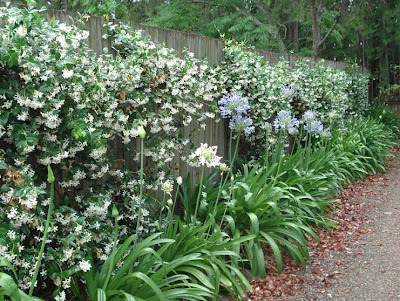 The star jasmine and agapanthus are really putting on a fine show after all the rain we've had lately. The gate was closed early Friday afternoon and is still closed now. We were shut off from the outside world, both physically and emotionally, all weekend and had all that delicious time to do our chores, relax and appreciate this life we live. Oh, there was one little visitor, L from next door, our 13 year old neighbour, came over to buy a dozen eggs and chat a while. He's a quiet and gentle soul so it's always a pleasure to have him in my kitchen talking about school and life at the end of our lane way. Aside from that brief visit, Hanno and I ambled through one chore after another, which were generously peppered with periods of knitting, reading, talking, tea drinking and planning. We are always planning! Will we take the tomatoes out this weekend? Where will we plant the next potatoes? 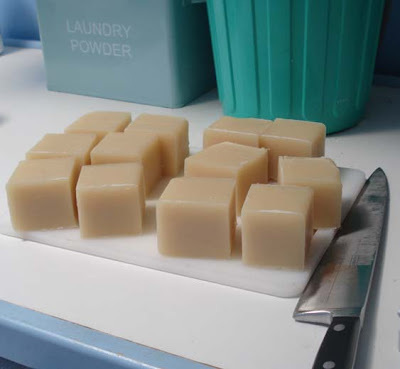 I had planned on making soap on the weekend and was all ready with the new soap mould Hanno made for me, but when it came to it, I had no coconut oil or copha, so I decided to do it next week. I always like to have extra soap on hand over Christmas so I have spare gifts for people forgotten about or who pop up out of no where. I have found that a gift of homemade vegetable oil soap and dishcloth is always appreciated. Most people see it as a quaint novelty from days gone by and it's only when they use them they realise how practical and lovely homemade items are. 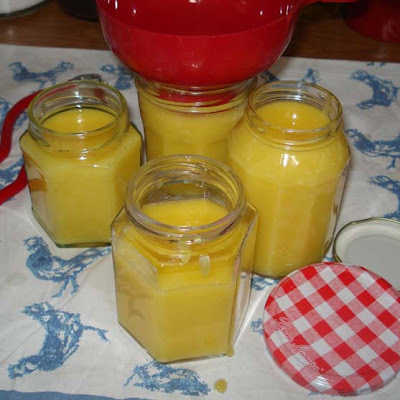 I had promised lemon butter (curd) to my friend Bernadette, as she did some knitting for me, so out came the lemons, butter and eggs and 30 minutes later I had four small jars of lemon butter. Homemade lemon butter is one of the true joys of home cooking. 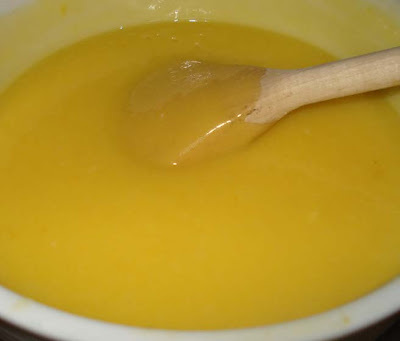 The bright yellow colour you see in those jars below is from fresh eggs and butter, not from the colourings and preservatives they put in the commercial lemon butters. 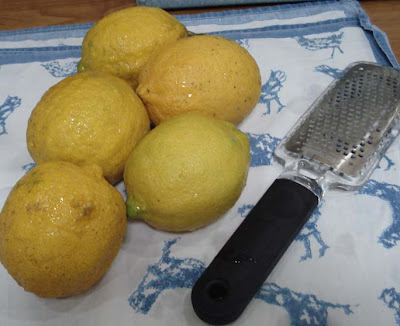 If you're new to jam making, try your hand at lemon butter. It's easier than jam and although there is 20 minutes of stirring, I know you'll be planning your second batch as soon as you taste it. Hint: you'll get more juice from lemons that have been picked the week before you want to use them. Put the eggs and sugar in a heat proof bowl over a saucepan of simmering water and stir till the sugar is dissolved. Add the lemon juice and rind, then the butter and whisk for about 20 minutes until the mixture is smooth and thick. Do not allow the mixture to boil as that will spoil it. You want the mix to thicken well and for all the ingredients to be thoroughly mixed together. When the lemon butter coats the back of a spoon without running off, it's ready. Pour the butter into warm, sterilised jars and seal straight away. Theoretically, it will last for two or three months but in our home that never happens. Hanno and I have already polished off the small, not-quite-filled jar in the photo. :- ) It's delicious on toast, pikelets, pancakes, as a cake topping, in tart cases, or on muffins or fresh bread. Hanno cut his own hair on the weekend and I tidied up the ends and back for him. He also did some gardening and laundry and cleaned out the chicken coop. I did some more work on the book, answered some emails (but I'm still behind), cleaned and took the time to visit some blogs. Our meals on both days were simple and quick. Leeks were harvested from the garden so we had leek and mushroom omelettes on Saturday and pea soup from the freezer on Sunday. 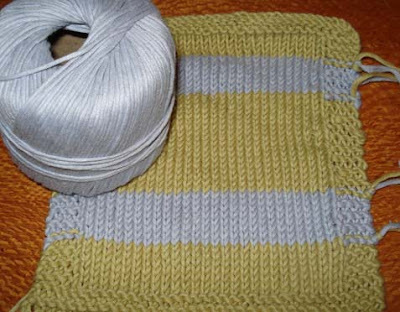 I started knitting a dishcloth using a 40% linen and 60% cotton yarn that is new to me. It knits well but is made up of fine strands of thread that tend to fall apart when it's been handled. I doubt I'll buy more of it because I had to watch every stitch. I also finished off another pair of fingerless gloves, this time with ribbed wrists. I'll blog about them later in the week and show a photo. I'm really pleased with them and have decided to do a few more pairs as gifts and to use up odds and ends of wool. They only take about three quarters of a ball and look really cute. I was going to blog about the meter readings today but thought it was a better idea to do it tomorrow. By then all my northern hemisphere friends will have their readings and we'll we able to compare both the readings and solutions for reducing them. So don't forget to have your readings ready for tomorrow. I hope your weekend was restful and productive and the week ahead is a good one for all of us. I've been busy over the past week but I'm feeling relaxed and rested nevertheless. My main task has been my book which I haven't talked about much lately but have had quite a few people ask me about, so here is an update. I'm working now on the book proposal, which I have to have finished by late December. The proposal is an explanation of what I an writing, how I see the book when it's finished, and what my subject matter is with a list and explanation of the chapters, and a couple of sample chapters. Basically I'm selling the book proposal, so it has to be the best it can be. Yesterday I spoke to a professor at the local university about book illustrators. He set me on the right path to find one - I would like to work with someone just starting out - and next week, I hope, I'll be sorting through examples of their work. So that takes up most of my days. When I have a break, I usually knit, walk around the garden, or do some housework. Hanno, as usual, is a great help to me. He hangs out the laundry, packs the dishwasher and does the grocery shopping. We make a good team because neither of us asks for help but it's always offered and the work gets done. I guess that comes from living together all this time - each of us know what the other needs and we step in to provide it. This is the latest addition to the gift cupboard. An organic cotton scarf that is silky soft and an absolute pleasure to feel on my neck. I'll have to make one for myself before winter comes around again. I'm really pleased that so many of you are interested in reducing your usage of electricity, water and gas and have joined the challenge to help your conservation measures. Like any other thing, having a firm starting point and knowing, really knowing, what our figures are gives us a way forward that is realistic and not based on a guess. If you want to join the challenge, read this post and add a comment. Then it's just a matter of reading your meters and working on reducing your usage. We are winning in a number of ways doing this - we are doing a little bit for our environment, we will save money and we are taking part in a community project, and it is always a good thing to join with others to work for change. So now I'm off to read my meters again. Over the weekend we'll work hard on reducing our usage of water and electricity and on Monday I'll report in again with my meter readings. We'll then have the chance to workshop what we all did and how we did it, so make sure you get your readings and report your findings and your measures. I wish everyone in the challenge good luck with all the measure you'll take and I hope your families chip in and help too. Welcome to all the new readers who have come here over the past week or so. I hope everyone has a lovely weekend. It's been raining here all night. I sleep like a baby when I hear rain falling on our roof. When I got up this morning and went outside, the small tank at the front was overflowing. 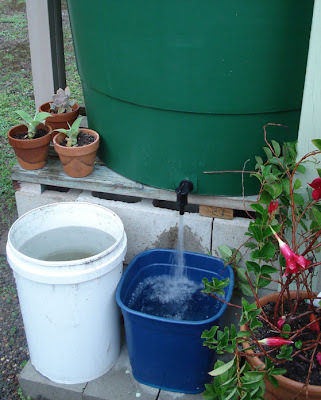 I grabbed some buckets and watered all the plants on the front verandah. Then filled the buckets again for the plants to be watered again in a few days time. It's another 30 litres of water saved. and the tank is already full again. Every drop helps. I hope many more of you sign up for the meter reading challenge. Knowing what you're using, either in water, electricity and gas, or only one of them, will help you reduce your usage. It's a small step but a very helpful one. There have been some wonderful comments so far about conserving precious water and electricity. I love reading how people get over the barriers placed in their way and work towards conservation. It helps our environment and it will save you money. So be part of the challenge and let others know what you're doing in the hope they'll join us. We are being told nearly every day that many Western countries will go into recession soon, or at least experience an economic downturn and tough times. Now is the time to start your cost cutting measures and save that money for what might happen in the near future. If you're lucky enough to bypass the troubles predicted, you could use the money saved to pay off debt. We're all in this together, so let's read our meters so we have a realistic measure to start with and then we'll work together to cut our usage. And remember, every drop you save, every light you turn off, every towel you hang outside to dry, helps our environment. 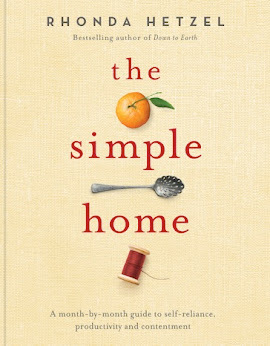 One of the wonderful things about living simply is that when you simplify your life, you become more frugal and green. You put the days of excess and mindless consumption behind you and you focus on conservation. This leads to your home using less water, electricity and gas, you use less fuel in your car and, in turn, not only save money, you do your fair share in saving greenhouse gases. I find it absolutely incredible that even though we know the climate is changing, few governments around the world have done enough to make the changes needed to reduce greenhouse gas emissions. There are some very interesting graphics relating to the USA here, but let me tell you that my own country (Australia) falls far short of where it should be, even though we are told repeatedly that our Great Barrier Reef is dying and will be dead by 2050! It's up to us, folks. We are the ones stepping away from the mainstream to live in a way that our neighbours don't always understand. As well as not spending like drunken sailors and living as frugally as we can, it's up to us to cut our own usage of fuels that will contribute to greenhouse gas emissions. Doing so will put us in a win-win situation: we lessen our own burden on our planet and we save money in the process. There are any number of footprint site on the internet that will tell you what your current footprint is, but I think it's better to do something more practical - measure your own usage and take steps to reduce. This is my challenge to you: I want you to read your water and electricity meters first thing tomorrow morning. Write down what your meters read and write down the time you do your reading. Then, that day and the following day do your normal routines without thinking about your meter reading - this is to get an accurate measure of your normal usage or electricity and water over two days. Next to your meter reading, write down what you do that uses your electricity and water so you know what contributed to your usage. So if you do laundry, write down how many loads, if you have a bath or a shower, write it down, etc. When you've monitored yourself for two full days, and at the same time you read your meter on the first day, read the meter again - and write it down. Then, for two whole days, I want your to reduce your electricity and water usage as much as you can. Turn off lights when you leave a room, turn off your computer when it's not being used, reduce your heating or cooling by a few degrees, do as much baking as you can at the one time, cut back on laundry, take shorter showers, turn off the tap when brushing your teeth. It's difficult to suggest ways for you to save as we are all so different, but you will know. And please know that all those tiny savings definitely add up - nothing is too small to do. I hope that a lot of you will do this with me. If there is enough interest we may do a week long audit - it will be more accurate. When we do the longer audit, we'll include our cars as well and monitor our use of fuel. But this will give us a good idea of areas in the home where we can cut back. It's important that we all do our fair share. Your home contributes to this global mess, just as mine does, so make sure everyone in your home knows what you're doing and ask them to help. This is a job for everyone - even small children, for it is their future world we're all effecting. Here is an old post about reading water meters. Reading electricity meters is here. If your system is different, go the the website of your supplier and they should have details on how to read your meters. Don't forget to do your first readings early in the morning of your next new day. Work two days doing your normal routines. On the following morning at the same time, do another reading - this will tell you what you used the two previous days. Then work two days cutting back as best you can on both water and electricity. On the next morning at the same time, do another reading of both meters - this will tell you what you used when you cut back. When you have your figures for your normal days and your followup readings for your two days of conservation, post them in the comments section of the post I'll do on the weekend. By Monday we should have all our figures in and we'll talk about it on Monday. My hope is that we see some changes that will show us all how we can cut down on our usage on a permanent basis. You will save money doing it, and in these times of rising prices, that is a great goal. But remember too that you'll be doing something practical from your own home to reduce your own greenhouse gas emissions and that is something we should all be striving for. In an attempt to spread the word, post about this on your own blogs and get as many people as you can to join us - every person who joins will add to a greater reduction. Please let me know if you're joining in. I'll be here to help you as much as I can. I want to write a bit more about time management. It's an important part of living simply and if you get this right, you'll make your life easier. If you've been reading here for a while you'll know I often write about finding a balance. For me, time management is the tool I use to find the balance between work and play. It's important to know that if you give yourself too much play time, you won't have the time to do the work you need to do and, of course, the reverse is true too - working through the day with no rest or time for yourself isn't healthy. You need to find the balance that suits you. This is me at work yesterday. I had to take a photo for the local paper and this was one of the rejects. My life is pretty easy and relaxed now that my boys have grown and moved away. 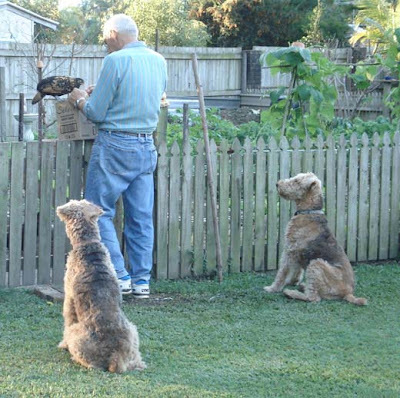 Now it's just Hanno and I, and our chooks, dog and cat. But there was a time when I felt like I worked from sun up to sun down, plus some. Luckily I realised early on that I needed to look after myself too and I made sure that I always gave myself time each day to sit and relax or do something that enriched me. I made time available to myself, I didn't give it all to my family or my home. I gave the gift of time to myself because when mama ain't happy, ain't nobody happy. And when I write mama, I mean papa too. If you work day after day doing only for others, no matter how noble and useful that makes you feel, it will eventually weigh you down and you'll begin to resent it. It is very important for you to nurture your family, but it's also very important to nurture yourself as well. You have to find something to renew and enrich your spirit every day - that may be sewing, having a cuppa with a good book, prayers or meditation, having a nap, writing or painting, soaking in a hot bath with cucumber slices on your eyes, doing your nails, writing letters, taking the dog for a walk or knitting. Whatever it is must give you joy so you go to bed each night feeling you've done your best in your chosen work - be that at home or outside the home, and that you've given time to yourself to be you. It doesn't have to take a lot of time, but if you use your time management skills, you'll be able to juggle your time to make available what you need. And this is something I found worked well for me - I told myself that I appreciated the time I had for myself. I actually said, sometimes aloud and sometimes silently, "this is good, you'll enjoy this", or "ahhh, I really need this time today, I'll make the most of it." Whatever it is that you say to yourself, say it so you mark your time as being separate. Acknowledge your enjoyment - it makes it more real. While time management is a big subject, the steps towards managing your time are all small. Start off with your list of "to dos" for your day, make sure you have your time in there too and refer to the list in the previous time management post. Always remember we aren't managing our time so we are slaves to our work - we do it to work efficiently, to get our necessary work done and to give ourselves time to relax and do what we love. I can't tell you what it is you'll spend your free time on, only you know that, but I will tell you that if you give yourself that time to do something you love, it will make a significant difference in your life. I spent quite a bit of time over the weekend staring out at the scene above. It's what I look out on when I sit in my workroom. "Workroom" is the inappropriate name I've given my sewing and writing room, but I have to admit, I don't feel like I'm working when I'm in there. Nevertheless, I did a few hour's work on my book, pottered around and talked to Hanno through the window while he painted posts on the front verandah. It was a lazy weekend. There was rain, a few visitors, knitting and a bit of cooking. All in all a very pleasant time. I hope yours was too. 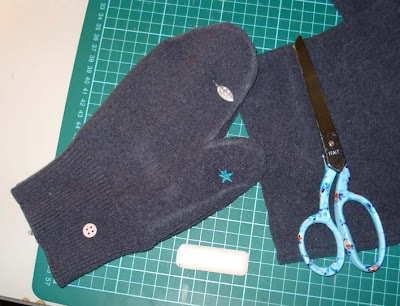 I found an old pure wool jumper that was washed in hot water a few months ago and cut a pair of mittens from it for next winter. There is still more than enough for a bag that I'll make up next weekend. I finished off the fingerless gloves I started a little while ago from the pattern Heather posted on the Simple Green frugal Co-op. Heather's blog is Beauty that Moves, it's one of my favourites and I recommend it to you if you haven't yet wandered over her way. 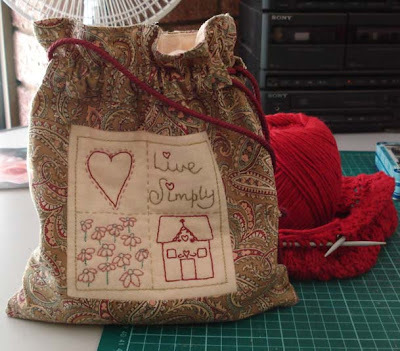 I finished off the weekend with the knitted red cotton bag that I started a month ago. I'm making up the pattern as I go but I'm not sure yet if I like what I did yesterday. I'll look at it again with fresh eyes this morning and see if I'll be undoing a few rows or leaving it. I often undo knitting, although I do it less now than I used to. I learn my life lessons as much by mistakes as I do by my successes. And my little simple living bag is there. I'm using it now as my pencil case for work. It contains pens and pencils, a calculator, eraser and post-its and it's easy to pop into my basket on work days and hang on a hook right beside my desk. I really enjoy having unique things to use in my home and at work. It exercises my mind to make them and reminds me when I use them, that remaining productive and creative pays off in meaningful ways and that beauty is often created at home. It's been a gruelling couple of days here. Tuesday afternoon my DIL Cathy was rushed to hospital with high blood pressure. My step son works three hours away, so I called him to come home, then Hanno and I went to the hospital. Cathy had a series of small strokes. She only in her mid-40s. She is okay and is home again now, and when I visited yesterday she looked good and said she felt okay. Hanno and I went to the doctor yesterday, I got the all clear but Hanno has something suspicious in his blood test and needs a scan and more tests. He says he feels fine so we'll just have to wait and see what the scan shows. My sister Tricia phoned last night to tell me our cousin Stephen is dying in a Sydney hospital. For a family that has never had much in the way of illness, we sure are making up for it. 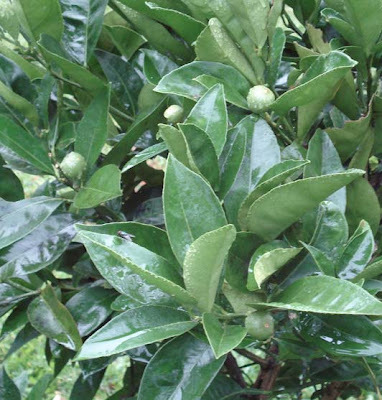 Next season's Washington Navel oranges - small now but they'll grow into globes of juicy sunshine by next winter. My garden is providing much needed solace for me right now. I go out there and I swear it transforms me. It's a particularly abundant garden at the moment with a lot of fruit growing, and although it's very slow, the promise of it is there. 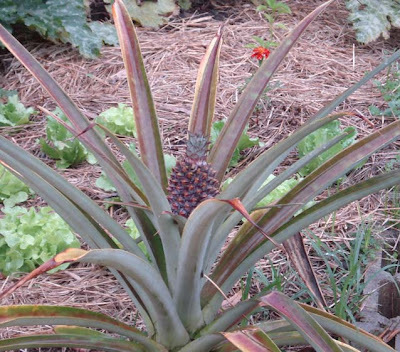 The pineapple top I planted two years ago is slowly - very slowly, maturing and is now presenting me with this small, but perfect, little pineapple. I cannot wait to taste this fruit. I'm hoping it will be ready for Christmas day. Hopefully, some red papaya will be ready for a fruit salad then too. We have two trees and both are setting fruit now. Further over in the yard, on the eastern fence line, luffas are growing. 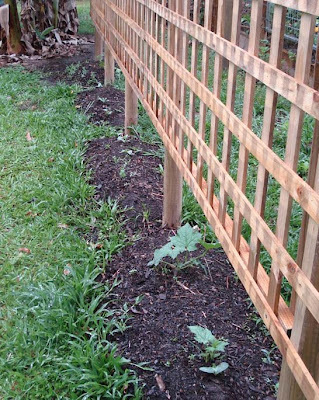 I planted them all along this trellis so they'll get full sun all day with a little shade late in the afternoon. Now that all the seeds have germinated, this garden bed needs the edges cut with a spade and lots of mulch applied. That will probably be a weekend job. The corn is healthy and producing fat, juicy cobs, and we are still drowning under a ton of zucchinis. 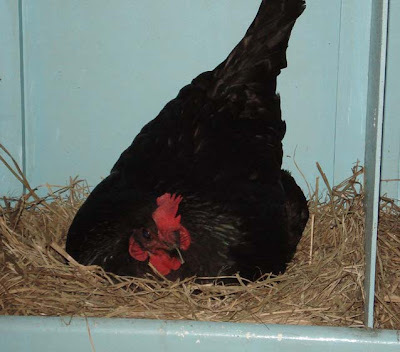 And while all this growing is carrying on, my lovely ladies keep producing about nine eggs every day. Mary is pictured above, making her contribution to her keep. 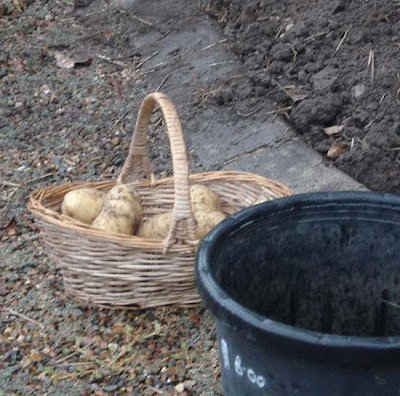 In the front garden, Hanno dug up the remaining potatoes. There was a small basket full which would be about 3kg (7lb). We haven't bought potatoes for months now and still have enough to see us well into next year. 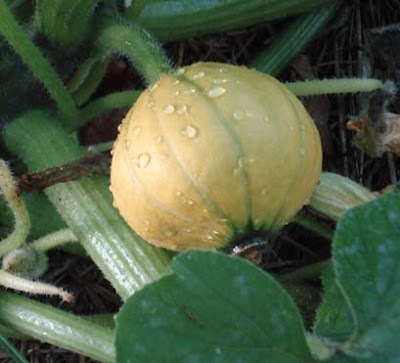 We have planted some golden nugget pumpkins out where the bulk of the potatoes were and they're growing really well. There are only four plants but that will produce enough for us plus a few to give away. I must remember to grab a few small potatoes for seeds and leave them out to sprout before we plant the new crop. Right next to the pumpkins, Hanno planted these little beauties for me - ginger and turmeric. In the photo above, the ginger is the larger one. 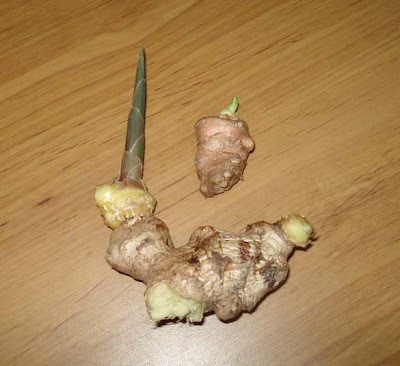 I use ginger for my ginger beer and both ginger and turmeric in curries so it's good to have them growing in the garden. I am moderating comments again. I was really disappointed in what happened yesterday and don't wish to discuss it further. I hope you all have a wonderful weekend and look towards next week with love in your heart and hope for the future. We had 45 mm of rain (just under 2 inches) yesterday. 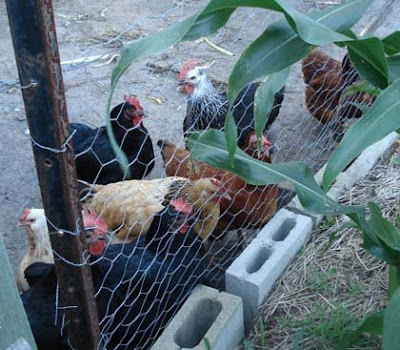 Here are some of our chooks drinking the rain caught on their wire fence. You are more likely to build the life you want for yourself if you use everything you have at hand. One of the things we don't always think of as an asset is the time we have available to us every day. Time is intangible, sometimes we forget it's one of our treasures. One of the many things I had to learn to give me the full measure of each day was time management. I have to know that the time available to me each day is used productively. It's too easy to sit down with a good book or my knitting, it's too easy to read blogs for hours and it's too difficult to recover from it. My simple life is about a mindful rhythm of work that bubbles along at an easy pace, it's about consistency of purpose and it's about focus and getting my jobs done. In a nutshell, it's about time management and if I keep to my plan I know that everything I have to do, as well as those things I want to do, will be done. I work harder in my home now than at any other time in my life. There are chores to be done here that in past times would have been done by others – I, like many others, bought convenience and freed my time to work for money to pay for it. I've seen the light now – I know that I can still have all I need and want in my home if I do the work for it – and to fit it all in the time each day affords, I need to manage my time effectively. 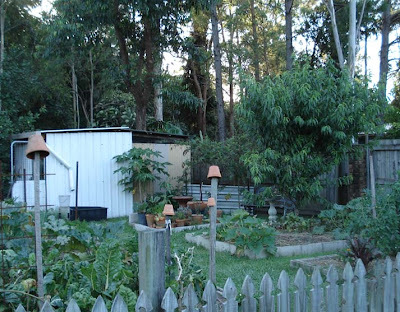 The vegetable garden, next to the chook house, from the other side of the backyard. I have goals. Every morning when I rise, I know what I want to do that day. I used to write it all down but now, with the experience of so many days and the rhythm of my work built into my days, I know what and when I will do my work. But this is one of the things you can do to organise yourself - write a list of what we need to do tomorrow. Write your list in the order you will do your tasks, or the most important tasks first, but we flexible enough to change it if it doesn't all go to plan. This is a difficult one to develop. I started doing this when I was much younger and my boys were in primary school. Then, I was working full time and studying for a degree, as well as being a mother and a wife. I discovered that if I rose early I had a few hours of time when I was alone to study or write. I still do this but now it's the time I write my blog - so what I want to do doesn't impact on what I have to do. Having your meals organised will help you relax enough for your other tasks. You'll know what you'll be preparing for dinner that night and have all the ingredients waiting for you. No last minute panic, no rushing to the store to buy something that is missing. I believe children benefit a lot if they grow up knowing they contribute in a practical way to the welfare of their home. From an early age, give them tasks, within the limits of their age and ability, that help with the overall running of the house and teach them how to look after themselves in the process. They can start off putting their dirty clothes in the laundry hamper, picking up toys and feeding the cat, and progress to more involved tasks as they mature. My days are made up of housework but for those of you who work outside the home as well, get into the habit of doing a few tasks each day. You might clean the bathroom, wash a load of laundry every morning, or vacuum the family room. Whatever it is you can manage during the week, it will keep your home in order and give you more time on the weekend to spend with the family. Turn off the TV, walk away from the computer, say no to the neighbour who always pops in for morning coffee. Say no to whatever temps you away from today's list. Saying no to time wasters will free up time for yourself. It will give you time with your family or to spend on sewing, or a spare 30 minutes to sit alone with your thoughts and a cuppa. Stockpiling groceries has turned my weekly trip to the supermarket into one that I do maybe once a month. Shopping once a month instead of weekly will free up quite a few hours for other things you need or want to do. Doing a few extra things at night will free up time the following morning. Most families are in a rush in the morning - if you can do a quick tidy up, make tomorrow's lunches, put on a load of laundry or pick out clothes to be worn the next day before you go to bed, you'll free up time the following morning. 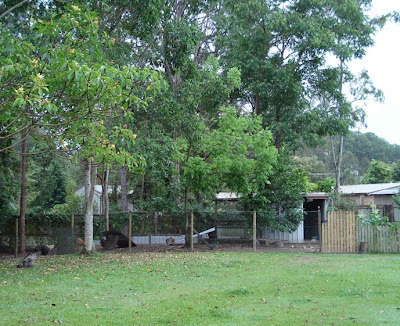 The chook house from the other side of the yard. We all have different demands on our time but one thing is common to us all, if you can manage your time effectively, delegate and make the deliberate choices that your own life requires of you, you will live well and have enough time for your family and for those things you want to do. I have no doubt that many of you have developed ways of managing your time to suit the life you live. I'd love to know what you're doing so please share if you can. On the subject of time management, I received an email this morning from a reader who was very upset that I hadn't yet replied to her email sent a week ago. I haven't yet replied to emails sent three weeks ago, however most of you know that I try to reply to a few each day. I've been ill and then trying to catch up with my work, not to mention my book, and some things remain undone. I am sorry you all have to wait but I can only do what I can do. I'm taking the email address down again and hope that things settle down soon. And to that reader, I will reply to your email but there are others ahead of you.